Standing on the National Mall last week amid a sea of hand-knitted pink Pussyhats, the unifying visual identity of the Women’s March on Washington, I couldn’t help but feel a sense of pride. Pride in being a woman, in being a maker, in participating in the resistance. Where would we be without Lady Justice and Lady Liberty? 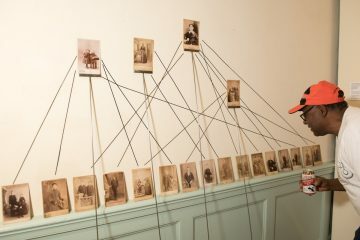 Like the stitches that made up every hat, so was each woman—a small component that, when repeated, becomes something greater than the sum of its parts. Created outside the traditional avenues of capitalist consumerism, the pink Pussyhat is a necessary rebuttal to its red made-in-China counterpart. Knitting itself—an activity dominated by women—is now an act of resistance. Like Ghandi’s Khadi cloth—a handspun garment that came to signify a social movement of self-reliance in opposition to colonialism—the Pussyhat acts as a symbol of solidarity and purpose. Like when I wear my black and white keffiyeh and I am stopped by strangers on the street who thank me for my support of Palestine, it is a declaration of certain values, of acceptance. Karida Collins, owner of Neighborhood Fiber Co., noticed a definite increase in foot traffic after the project launched, but she didn’t actively encourage people to knit Pussyhats. “Initially I had, and continue to have, complicated feelings about the march because of my position as a black feminist and the lack of intersectionality,” she said. As the movement grew and leadership developed to include veteran women-of-color organizers, for Collins, the march became a much more tangible act of resistance. 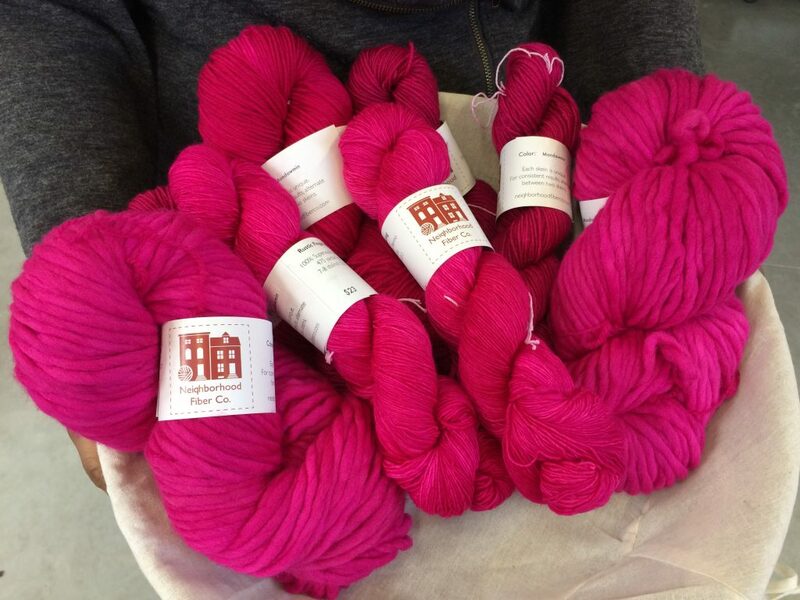 All of the yarns at Neighborhood Fiber Co. are hand-dyed, each one named for a neighborhood in Baltimore or DC, where she started her business. Station North is brick red, Canton a mint green, Druid Hill an earthy gray. But the color she chose to discount for the pink Pussyhats, in particular, represents an important site of black resistance against police brutality: Mondawmin, where the uprising began after the death of Freddie Gray. 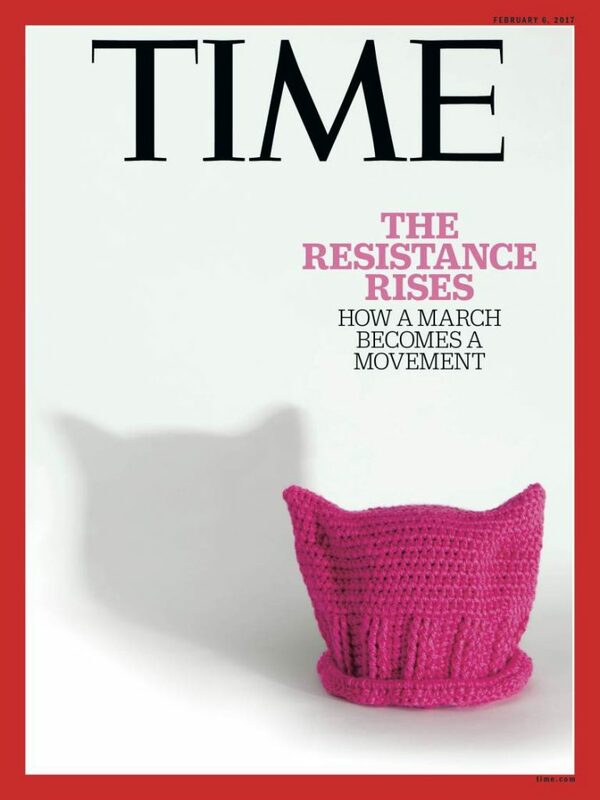 Since the march, other leaders in the knitting community have designed new knitting patterns, such as the “Peace de Resistance Mittens” that say “Resistance is not futile” on the top and show a fist on the palm. All proceeds from the pattern will go to fund inclusive charities like Black Lives Matter, Standing Rock Legal Defense Funds, Days for Girls, Trans Youth Equality Foundation, and others. 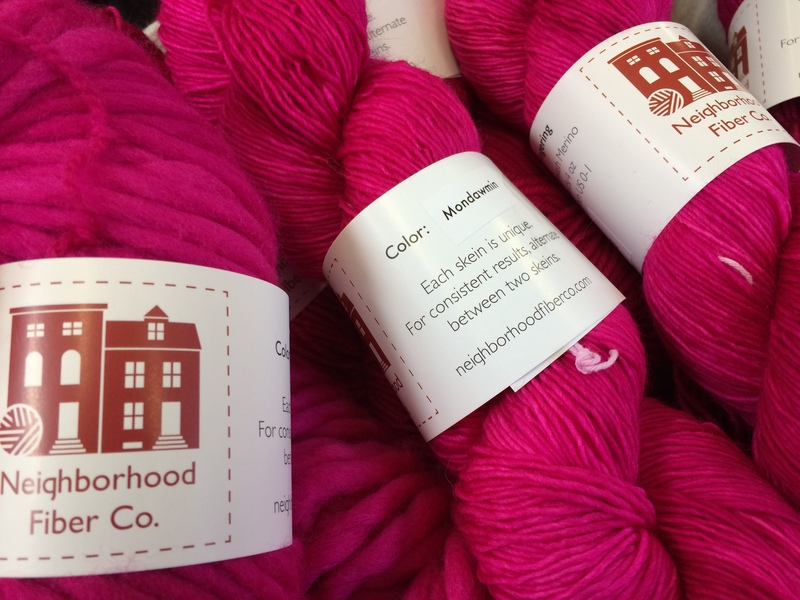 Neighborhood Fiber Co. regularly hosts fundraising efforts where a certain percentage of sales go toward charities. Until January 7, 100% of proceeds from a new graffiti-dyed yarn, Shami (named for street artist and activist Abu Malik Al-Shami, but also Arabic for Syrian), went to the White Helmets, a Syrian civil defense group that rescues civilians after an attack. 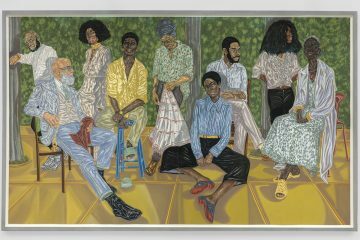 After Freddie Gray’s death in 2015, Collins donated proceeds from a limited edition of Sandtown-Winchester yarn, the neighborhood where Gray was arrested, which is one of the poorest, most gang-ridden neighborhoods in Baltimore, to the Baltimore Community Foundation’s Fund for Rebuilding Baltimore. 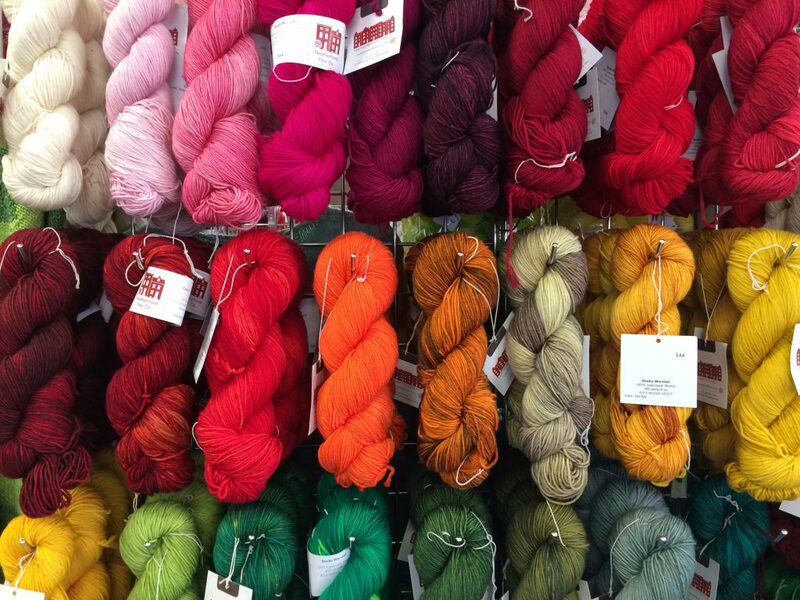 They sold 350 skeins for a total of $10,085. After the shooting last summer at Pulse in Orlando, 25% of all online sales went to Everytown for Gun Safety. 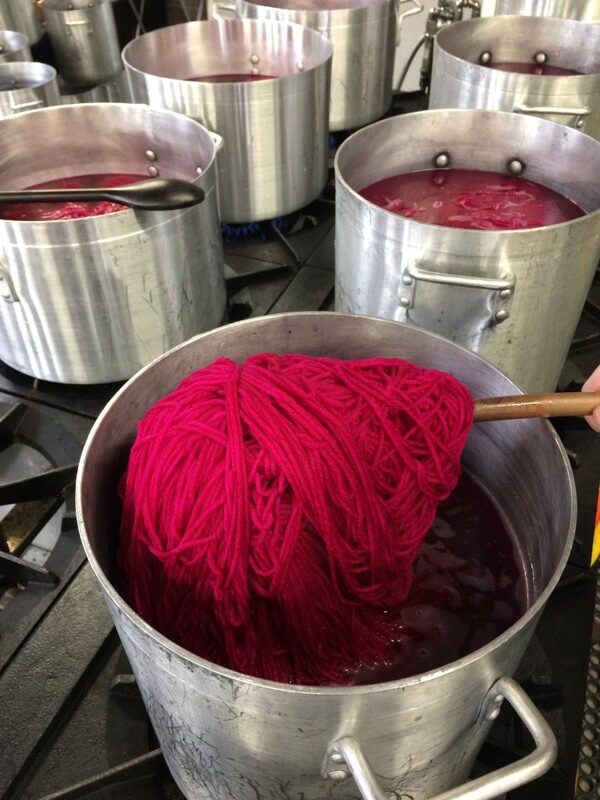 Neighbohood Fiber Co. sold over $6000 of the discounted pink Mondawmin yarn before the march, not including multiple wholesale order of hundreds of skeins of yarn for other retailers. And they’re still dyeing more. “I think the intention behind the Pussyhat is 100% about unity, which is really important to me in a Donald Trump world,” Collins said. Since the election, she had a logo developed that depicts a raised fist holding a ball of yarn with the word “UNITY” printed underneath. 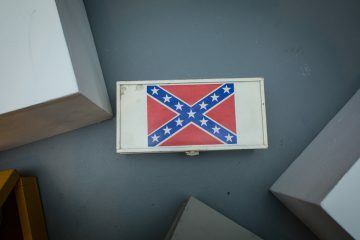 T-shirts and bags with the logo are sold in the store, and window clings are in the making so that other businesses can identify themselves as safe spaces. 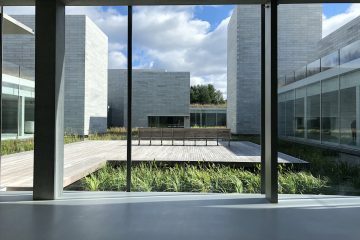 “I want to focus on making this store a space that is a site for resistance,” Collins said, whether that means knitting pink Pussyhats, fundraising, or community organizing. 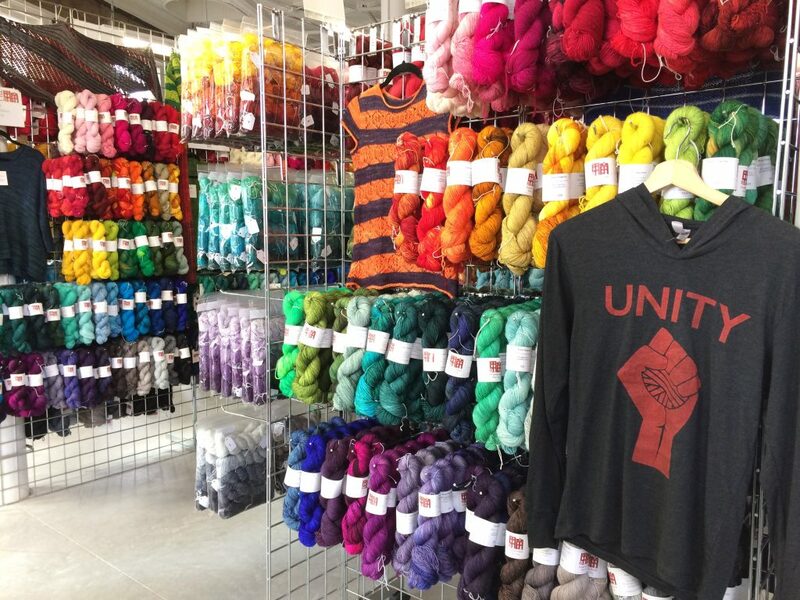 Collins thinks that knitters are overwhelmingly progressive, especially her customers. 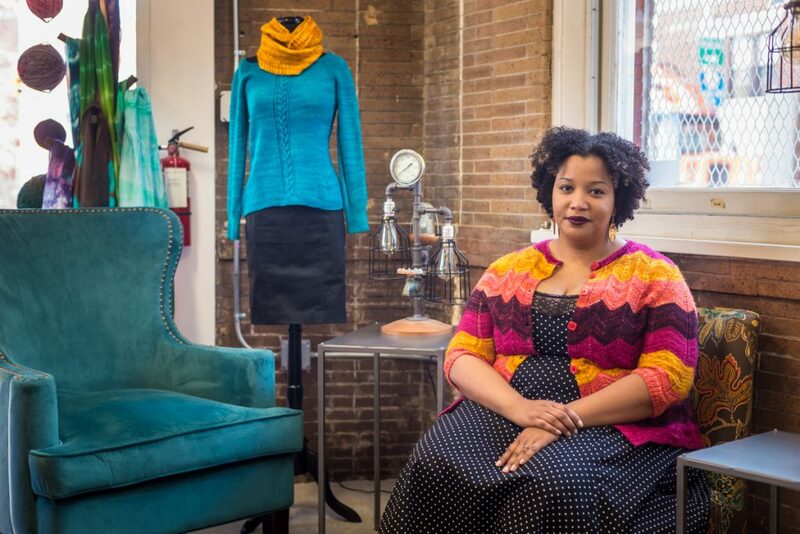 Her next plan is to direct her attention toward The Yarn Mission, a knitting movement that is explicitly pro-black, anti-police brutality, and pro-resistance that was born out of the Black Lives Matter movement. “I think there are different ways to be a feminist,” said Collins. “Different ways to offer visible resistance. A lot of people want to do something, but they don’t know what. It’s nice to say, Here is a way to do something. We make things,” Collins said. Sign-up for the Neighborhood Fiber Co. newsletter on the website and look for upcoming events and ways to get involved and show your support! 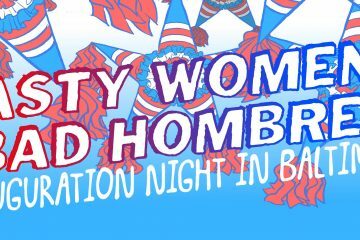 Learn more about the Pussyhat Project on their website.